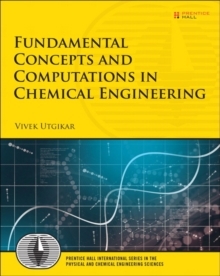 The Breakthrough Introduction to Chemical Engineering for Today's Students Fundamental Concepts and Computations in Chemical Engineering is well designed for today's chemical engineering students, offering lucid and logically arranged text that brings together the fundamental knowledge students need to gain confidence and to jumpstart future success. Dr. Vivek Utgikar illuminates the day-to-day roles of chemical engineers in their companies and in the global economy. He clearly explains what students need to learn and why they need to learn it, and presents practical computational exercises that prepare beginning students for more advanced study. Utgikar combines straightforward discussions of essential topics with challenging topics to intrigue more well-prepared students. Drawing on extensive experience teaching beginners, he introduces each new topic in simple, relatable language, and supports them with meaningful example calculations in Microsoft Excel and Mathcad.